Losing weight as a mom can be hard. Between juggling all of our responsibilities, finding time to workout, and avoiding that late night emotional eating, it’s just plain hard. Are you currently struggling with this? If so, I’m right there with you. 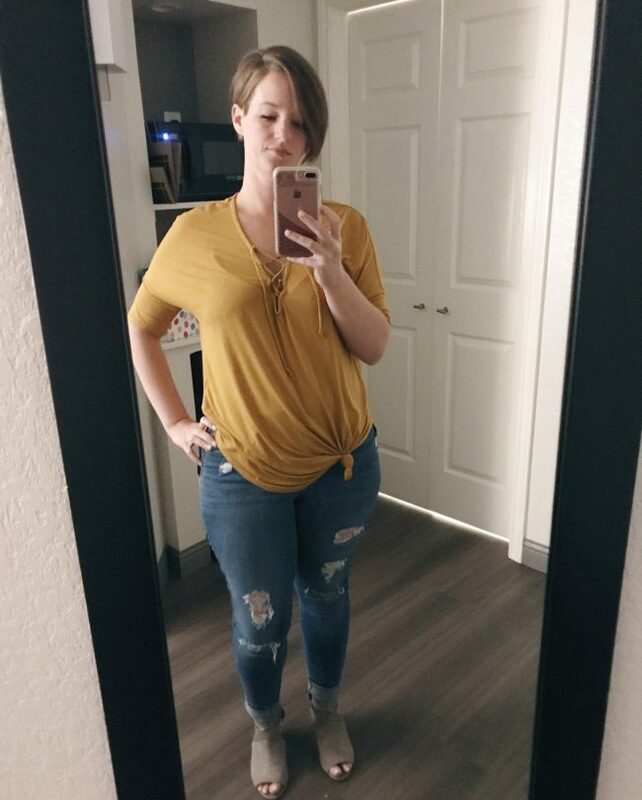 After years of maintaining my goal weight after my second child was born, I recently found myself with about 30 pounds to lose, even though I didn’t change my diet. How did that even happen?! I buckled down and started focusing on weight loss over a year ago. It’s been a struggle, because what used to work, no longer did. In fact, I just kept gaining weight. Finally, I found the Trim Healthy Mama plan this spring and it’s been pretty much smooth sailing ever since. A gentle weightloss program full of whole foods. One that focuses on overall health and doesn’t push unhealthy practices. My weight loss is slow, though. Slower than most. That makes for some pretty frustrating times. It can also be a big blow to your confidence, too. Still, I know I’m doing great, and try to do a few things to keep my confidence boosted through this journey. If you’re also on a weight loss journey, these tips might be a big help to you, too! Stuck in oversized tunics, long tanks, baggy jeans, or loose-fitting tops? Stop that. I get it, because I’ve always had a strong urge to hide the least flattering parts of myself. However, I looked at some pictures of myself about two months ago and realized I couldn’t tell if I’d lost weight at all. I was baffed, because I’d lost over 10 pounds at that time and gone down a pants size. Why didn’t it look like it?? Then I realized what was really going on. It was the clothes. I was basically wearing a tent, and it wasn’t doing anything for me. I bought a few tops in a size down, and opted for a less flowy style. Guys, what a huge difference that made! Since making that one switch, I can now look at candid photos of myself without cringing. I look at the girl in those photos and think that she looks pretty good. If you’re wearing oversized clothes in an effort to hide the weight you want to lose, do yourself a favor. Grab a couple of tops with a better, more flattering fit. It’ll do wonders for your self-esteem! Put some effort into getting ready. Stuck in a yoga pants and tank top rut? Forgot what your hair looks like when it’s blow-dried? I hear ya, mama. I get the same way. But, I can also say that when I do that too many days in a row, I can feel it. 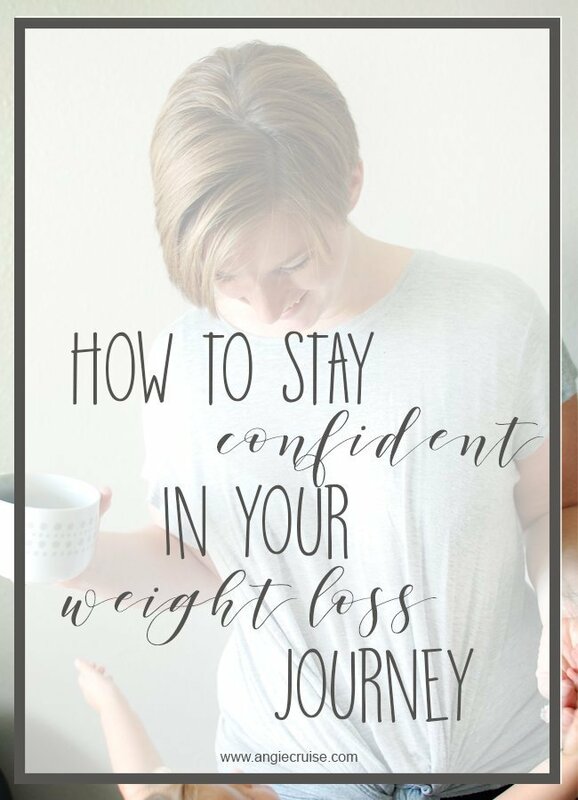 It might be more comfortable than pants with a button and hair in your face, but I know for me, it also adds to those “frumpy” feelings that start to stir when the scale is moving too slow. (Or, not at all). Instead, I’ve found that I feel much better about myself when I put in a little effort. A shower and blow dry, some mascara, and some clothes that fit well are a great confidence boost on those hard days! I just mentioned that I recently saw some candid pictures of myself and didn’t cringe. Ya’ll. I can’t tell you the last time that happened! The experience was really eye-opening, because it helped me see the progress with my own eyes. I know a lot of people like to take progression pictures standing in the same poses to really show off the difference. That’s awesome, and I always cheer them on. However, the un-posed picture I wasn’t expecting is the one that really opened my eyes. Do you have any of those? If not, be sure to get in front of the camera! Workout, but not to lose weight. Ya’ll. Working out doesn’t have to be the enemy. Whether you’re pushing yourself to exhaustion or avoiding it at all costs, there is a better way! I used to do the same thing. Either I’d work out until I exhausted myself, or I’d stop all together. Working out was really only something I did to lose weight and fit into my favorite jeans. I don’t know about you, but that’s not enough motivation for me. I no longer workout to lose weight. Now, I do it because my body deserves it. That shift in thinking didn’t happen over night, but it’s helped me keep a consistent routine that I actually enjoy. I love getting on my mat to do yoga. I miss it if I don’t make the time! Plus, it’s a fun way to track progress that has nothing to do with the scale. Instead of looking at a number that might be moving slow, I get to notice how much easier a pose is today than it was two weeks ago. I get to set goals for what I hope to accomplish, and watch myself actually achieve them. On a weight loss journey that’s taking longer than you’d like? Struggling with keeping your self esteem up during that weird “in-between” size? Hopefully some of these ideas will help you the way they’ve helped me. 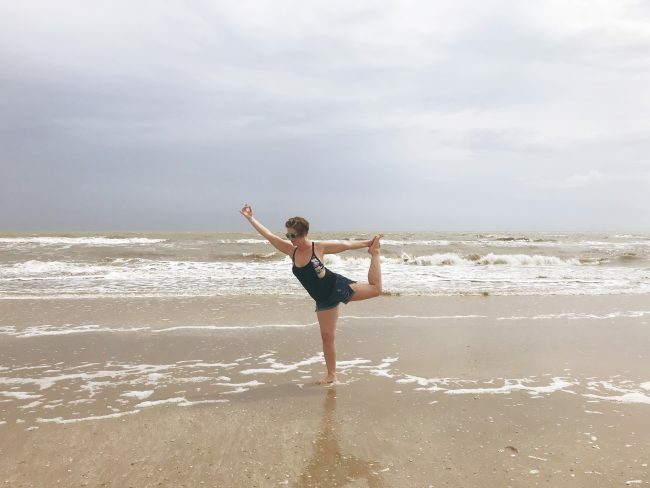 Want to learn more about my Trim Healthy Mama lifestyle or how I got started on my yoga journey? Check out these posts!